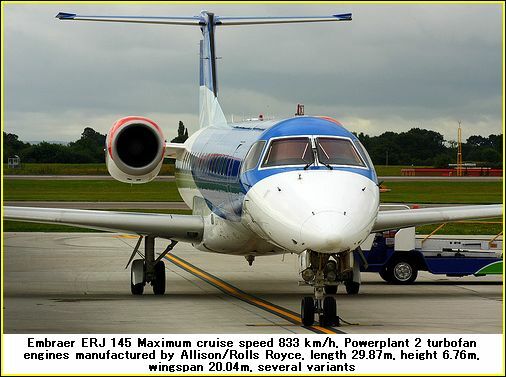 Embraer Airplane Photos has many images of practically all the aircraft manufactured by Embraer. Embraer's headquarters, main production facilities, and engineering/design offices are in São José dos Campos, São Paulo. Their production plant and flight testing facility is in Gavião Peixoto, São Paulo. This facility includes a 16,400' (5,000 m) runway, which is the third-longest in the world. It is the third-largest aircraft company in the world regarding annual delivery of commercial aircraft (behind Boeing and Airbus). 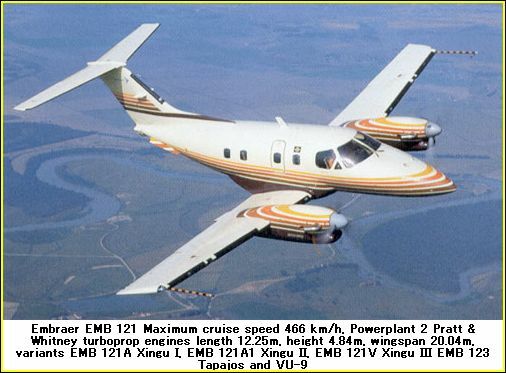 The EMB 121 Xingu first flew on 10 October 1976 and production ceased in August 1987. There were 106 of these airplanes built of which approximately half were exported from Brazil. Today the Brazilian and French Air Force as well as the French navy continue use the Embraer 121 aircraft. The Embraer 135 is a regional jet airliner as well as a corporate jet. It was derived from the 50 seat ERJ-145. Launched in September 1997, delivery of the first airplane was to Continental Express on July 1999. The main difference between the 145 and 135 is the shorter length by 11ft 6in (3.50m) which is equivalent to 2 fuselage plugs or sections. The Embraer RJ145 seats 50 passengers and is sold as a regional airliner. It was first launched in 1989 at the Paris Airshow. It first flew in August 1995 owned by ExpressJet Airlines who are the largest operators of the RJ145, followed by American Eagle. 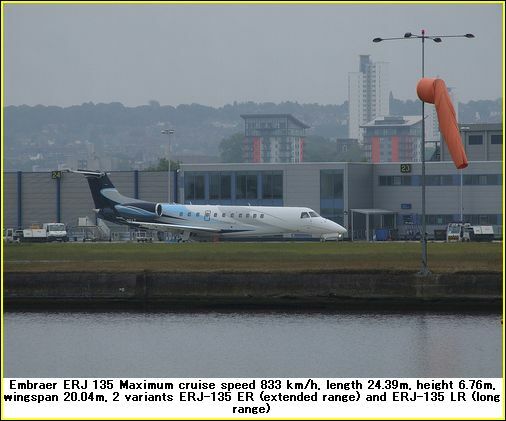 There are three versions of the 145 - the ERJ-145ER (extended range), the ERJ-145LR (longer range) and the ERJ-145XR (Extra Long Range). The Embraer 170 is the next in the Embraer Airplane Photos series. 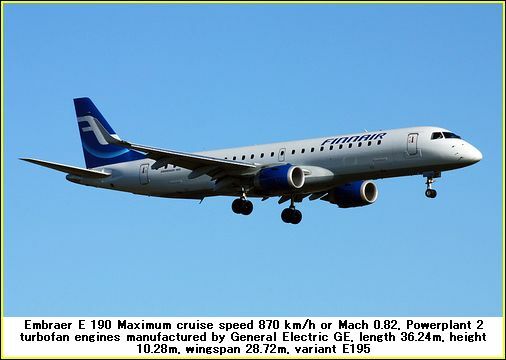 This Embraer jet is a 70 seater configured in a four abreast setup and was first delivered to LOT Polish Airlines in March 2004. 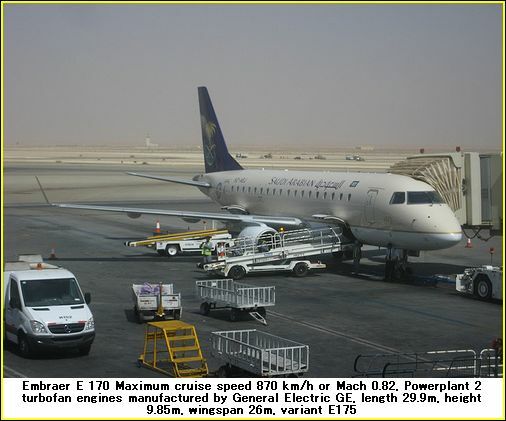 They are powered by GE and not Rolls Royce as other Embraer jets are. Refuelling only takes 10 minutes. Note the engines mounted under the wings and the change in tail design. The first flight of the E-190 was in March 2004 and the launch customer was JetBlue which had placed 100 orders and 100 options. This was the largest order of the Embraer 190 by any airline company. As this airliner is larger than the 170 it is operated with both Business and Economy class seats. Total seat capacity of the 190 is 98 seats in a four abreast configuartion. The aircraft is of conventional low wing design and has two podded engines mounted below the wings. The wings fitted with winglets, reduce the drag of the wing vortex and provide increased lift and improved efficiency of the wing. The Embraer Phenom 300 has a flexible seating configuration for up to 9 occupants, includes a private rear lavatory, refreshment center and baggage area. 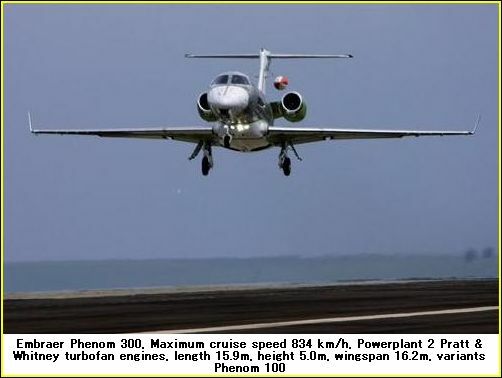 The first Phenom 300 was delivered to Executive Flight Services of Brazil in 2009. This Embraer jet is a light jet estimated at US$ 8.14 million as of 2010. Return from Embraer Airplane Photos to Airplane Photos.